If you’ve ever studied online then you’ll know how important organisation is for keeping on top of everything. This is even truer if you are studying online while juggling a family. Over the years I’ve done a bit of everything when it comes to study. I’ve studied two degrees on campus, done several subjects by distance education (way back when they sent all the course materials and paperwork out by post!) and completed a number of courses and a diploma online. I know how much of a juggle each one can be. Online study gives huge flexibility to work around a family or other work commitments but it does take a lot of motivation and organisation to stay on track. Before you take on an online course you need to work out how much time you have to dedicate to study and how you’ll fit it in. 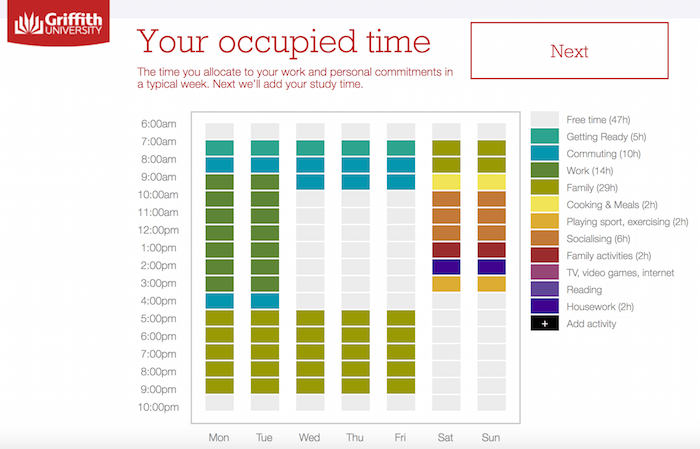 This online scheduler is awesome for divvying up your time and working out where study can fit it. You can drag and drop things around, allocate different activities and even email it to your spouse or kids so they know when you are busy and not to be disturbed. Where can YOU fit study in? Each day, write down the tasks you need to complete and dedicate your most productive time by tackling your biggest job first. Avoid procrastinating and completing smaller and less important tasks. Make sure you tackle what really matters before working on other things. Treat your study time as you would a lecture or tutorial. Turn off all distractions, send phone calls to voicemail (you can set an emergency number option on your phone so only certain numbers come through- the school for example). Trying to stay on top of everything that’s going on with study and a family is a huge juggle. Don’t rely on your memory. Keep everything written down on a family calendar and make sure each family member knows what is their responsibility to do. A family calendar can be used for everything from sport practice, school activities, dinner duty and more. 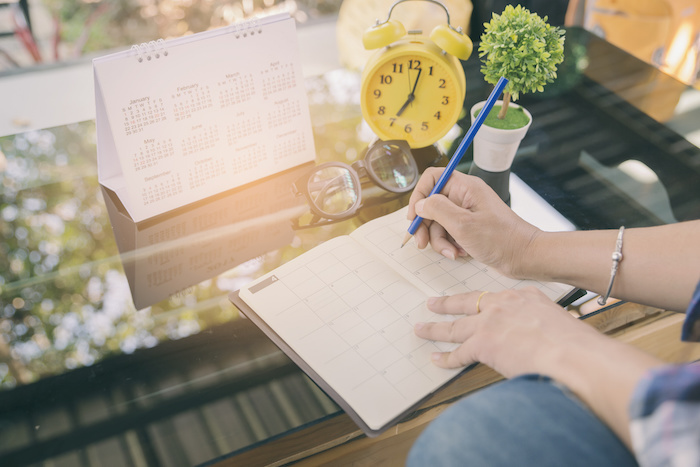 You may also want to add in your assignment due dates and other important study times so the family know when you’ll need to step back and focus more on study. Mums are very good at being everything to everyone. If you’ve decided now is the time to study and dedicate some time to YOU then you’ll need to take a step back and enlist some help. Small things like allocating dinner to other family members and making sure everyone has a fair share of chores can make a big difference. If you are studying around small children who are at home see if you can enlist some childcare help. Perhaps swapping play dates with a friend so you both get some kid free time or having your partner take the kids out for half the day on the weekend. If it is affordable, paid help with housework is also priceless when it comes to keeping the home running smoothly. Study can be a challenge even for the most organised and motivated people. Don’t make the mistake of giving up all the things in your week that bring fun and enjoyment. Cutting out social activities, exercise and family time will end up making you resentful and add to your stress. Make time for things that help you manage stress, make you laugh and bring fun to your life. For many women, having children prompts a change in direction career wise. This has certainly been the case for me! Before I had my boys I worked full time as a Paediatric Audiologist with families and children with a hearing loss. I LOVED my work but I couldn’t juggle it with my kids needs and my husbands work schedule and long commute while they were so young. We decided that me being at home was the best option for our family. After leaving my previous role I decided to look into what flexible work I could do from home and around my kids. Since then I’ve been writing this blog as well as working as a freelance writer and in social media management. I’ve done several online courses to help me develop skills in this area and I think longer term I’ll probably balance online work from home with part time work as an Audiologist when my kids are bigger. 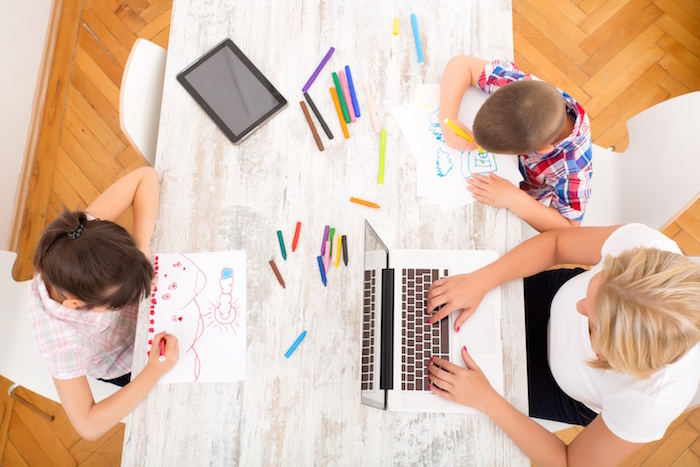 If flexible jobs that can work around kids are what you’ve been looking for then here are some options. Marketing is an extremely diverse and surprisingly flexible career. It can include everything from advertising to branding, strategy, metrics, reporting, digital media and more. One of the reasons it is a great option for mums is that many roles can be performed remotely or on a freelance basis. Many people have Bachelor degrees that have lots of transferable content for marketing. Studying online can be a great option for retraining and refreshing your skills and knowledge after a career break. 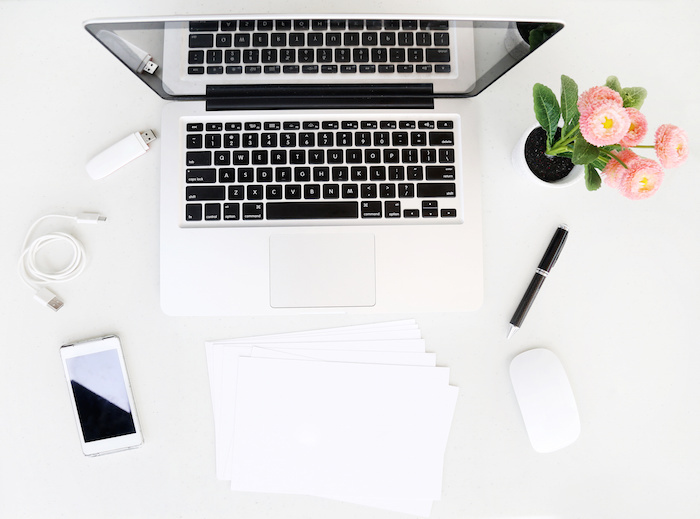 Griffith University’s Master of Marketing or Graduate Certificate in Marketing are both ideal for those looking at marketing and both are available online. Before I started this blog I had never really thought about writing as a job. I’ve always loved writing but I never considered that I could make a career out of it. Freelance writing can be a challenge to break into but it is super flexible and can be done from anywhere. If you are a good writer and can clearly get a message across, then writing may be for you. Those with a specific background such as health or HR can also look into industry specific writing. Freelance writing can also be paired very well with social media management and marketing. Teaching isn’t the 9-3 job that many think but it can be a great option for those who’d like to have the flexibility of school holidays off. There are also a lot of options for casual and contract work. A desire for flexible work prompts many women start a business for the first time after having kids. If you have a specific trade, profession or skill that could be done as a business then this could be an option for you. Remember that small businesses generally don’t generate a profit straight away and take a lot of time and money in the initial few years. The Graduate Certificate in Business Administration is a great option for building skills in marketing, accounting, people management and more, and can be used as a pathway into the Master of Business Administration.. Study in these areas can be a great idea for anyone looking at starting a business and is highly transferable if you decide small business isn’t for you. If you’ve got a flair for the visual then design careers could be for you. Think anything from website design and graphic design through to interior design or landscape design. These types of creative roles can be super flexible for remote and contract work that many women want. Whatever it is that you decide to pursue, online study can be an ideal way to get back into the workforce and brush up your skills (& resume) after a career break. Check out Griffith University’s many online options and use their scheduler to work out what might be possible for you and your family. Thank you for this great article. I am preparing to go back to study next year online. The online scheduler provided in this post by Griffith is an excellent tool. Is there somewhere else I can find this tool that isn’t linked to Griffith that I can use weekly?